My go to program to open any file that is unrecognizable in Windows is notepad. If the file happens to contain any readable text then you can at least get an idea what the file is. 4) Make sure to uncheck "Always use the selected program to open this kind of file" if you do not want this program to become program to open any file with the same file type. However if you forget to deselect the option "Always use the selected program to open this kind of file" (as I often do) then Notepad will ever be associated with any file of the same type of file extension. Rename the text document to âtest.exeâ. Locate in explorer file you need to remove the file association for and right click on the file andd choose âopen withâ and select âChoose default programâ. Now, you will get a list of program to choose from, click on âBrowse..â at the bottom of the list. Navigate to desktop and choose âtest.exeâ. Now, the file files would be associated with the âtest.exeâ program. Delete the âtest.exeâ file you created in the desktop. Now, the file should not be associated with any program. One my excel nuisances is spreadsheets that link to other external documents. If you plan on sending a file out, I feel that external links, should be avoided at all costs in the professional environment. External links may seem to work fine when the files are all your computer but once you give that file to another party it creates issues because excel can no longer find the file. Also changing the source document after you link to it also can create more issues. So having said that, here are useful tips for finding and removing external links. 1) The easiest way to remove links in excel is using the "Edit Link" option on the Data ribbon. Here excel will list all the external documents that a spreadsheet is linking to. You can select each file listed then click "break links" and excel will replace the formulas that contain external links with values. The problem with this feature is you will not always know which formulas you are editing and the feature does not work on some links. 2) If you want to view each external link before editing it another option is to search for all external links. This can be achieved by using the "Find and Select" option on the Home ribbon. If you click the "option" button you can select to search the worksheet or the whole workbook. Now in the "find what" box type "[" or ".xls" without quotes. 3) Now if you tried the above and you still have external links this may be due to defined names that exist in workbook. You can see if you have defined names by clicking the "Name Manager" on the Formulas ribbon. Delete any names here that have errors or that are linking to external sources (make sure you correct any of the formulas using these names first, of course). There has been recent influx in cell phone text scams. These scams are an attempt to steal personal banking information or credit card information. The text message I received was from 917-822-2827 with text text "J P Morgan THPV alert". Please call 817685077". Why is this a scam? The text is vague and does not provide identifying information. As widely discussed Google's Gmail platform has a neat little feature to undo a sent email if you want to recall within 30 seconds. The workings behind this feature is pretty simple. Google's server waits 30 seconds and only if the user doesn't click "undo" will it then send the email. No other platform that I am aware has this ability to do this. However, in most email software (including outlook) you can enable "automatic spell checking for every email" which adds an extra step to the sending process and gives you an extra time to ensure that each sent email is really what you want to send. Now this will only stop an email from being sent if any word is spelt wrong. To make sure every message requires an extra review add/modify a signature to your account under "Mail Format" and add an abbreviation (or your last name may work) that is not in the default dictionary such a Tel., thnx, etc. 2)Facebook fan page - This enables customers to "like" your store which adds a link to your store in your customers profile. This is great way to get referrals from you happiest customers. It also gives you an easy way to post news and updates on your store. This is completely free and easy to setup. All you need is a facebook account to link your page to. 4) Simple Webpage - You should have at least a simple web listing. At the very least your webpage should include your address, brief description of products or services, hours, and phone number. 5) Yellow Page Listings - Add a free business listing to superpages.com and yellowpages.com. These are the two most popular online yellow page directories. You can add a free listings to both of these: supermedia.com/ and http://yellowpages.com/. If you are trying to convert a Microsoft Excel 2007 file to open with Excel 2003 you may receive an error that there are "Too Many Cell Formats". After spending quite sometime I found a fix for this. You need to open the file in the Excel 2007 and run the macro below and then resave the file. Before you do anything make sure you save your file in case you don't like the results. 5 ways to keep a tab on your town with RSS feeds. Twitter: Find out about what people are tweeting about around your town. With this feed you may get periodic traffic reports, restaurant reviews, odd events, and more. http://search.twitter.com/search.atom?q=%22Your%20Town. Go to your local craigslist site. Enter your town in search bar ( Under the heading "Search Craigslist"). Click the "RSS" logo in the bottom right of the search results for your local rss feed. Replace [your-city] with name of your city (replacing spaces with "-") and [state abbreviation] with your two letter state code (IE: NY). Weatherbug.com offers free weather forecast subscriptions so you can get your daily forecast for your town sent to your reader. Here is simple method of getting an rss script of all your friend's Facebook Status update. Once you get this link you can read your friends status in your favorite rss reader (google reader) without having to login to Facebook. In the url address bar replace "friends_notes.php" with "friends_status.php"
with the id and key being unique to your account. In the url address bar replace "share_friends_notes.php" with "friends_status.php"
Obama issued the "Making Work Pay" tax credit for 2009 and 2010 tax payers as a form of stimulus which would increase the paychecks of workers through 2009 and 2010. You may of noticed that your paycheck has increased this year due to this credit. This credit could be headache for some filers come April 15th. The credit changed the withholding tables that employers use to calculate your withholdings. Since your employer doesn't know your tax situation you should always keep an eye on your withholdings. With the new credit the federal withholdings tables are adjusted so that if a single filer makes less than $75,000 his withholdings are lowered by $400 and a married filers withholdings are decreased by $600. If you are single you will be able to claim the credit on your 2009 tax return for $400 (if you made less $75,000). If you are married you can claim a credit for $800 (if you made less than $150,000). You earn income from more than one job. Both employers will give you the withholding deduction when in reality you can only claim one credit, $400 if single, $800 if married. If you are married and both you and your spouse work you will each have received $600 more in 2009. However the credit is only $800 for a joint filer making your withholding's less than the tax anticipated. Over the limits -- The credit starts to phaseout at $75000 adjusted gross income for single filers ($150,000 for Joint filers). If you are over the limit you employer may still give you the credit if you are not over the limit for that one job leading to your withholdings being less than they usually would. Note that this credit may also lead to additional late payment penalty if your withholdings are less than the tax due with your 2007 tax return. The IRS requires your withholdings (or estimated tax payments) to be 100% of the previous year tax liability or 90% of the current year tax due. Circular 230 Disclaimer: Please be advised that, unless otherwise stated by the author, any tax advice contained in this message is not intended or written to be used, and cannot be used, by the recipient to avoid any federal tax penalty that may be imposed on the recipient. Below is outline of the tests used to determine whether a lease should be accounted for as a Capital Lease or an Operating Lease for GAAP Accounting. (c) if there is an option to purchase the asset at a "bargain price" at the end of the lease term. (d) if the present value of the lease payments, discounted at an appropriate discount rate, exceeds 90% of the fair market value of the asset. I was looking this up for a client and confirmed on phone with NYC department of finance and on their website. if you were a resident of the City, exceeds the amount of any City tax liability computed and reported by you on the City portion of your New York State tax return. New York City Housing Authority. Also, you are exempt if you are a NYC Housing Authority or Transit Police transferred into the New York Police Department. The new American Recovery and Reinvestment Act of 2009 was signed by President Obama on Feb. 17, 2009, U.S.
Tax credits are available for qualifying garage door purchases placed in service from Jan. 1, 2009, to Dec. 31, 2010. The maximum tax credit a taxpayer may claim is 30 percent of the cost of each product and $1500 over the lifetime of the tax credit periods (2009 and 2010). * The door must be an insulated residential garage door, installed on an insulated garage. * The door's U-factor must be less than or equal to 0.30, even if the door contains windows. * The door perimeter must be able to control air infiltration. * The door must be expected to remain in service for at least five years. * The garage must be part of the taxpayer's principal U.S. residence. As well as receiving the credit a new garage door can also significantly improve a curb appeal and value. As you may know, a tax credit is more advantageous than a tax deduction since it decreases your tax liability dollar for dollar, as opposed to a tax deduction which decreases your taxable income subject to tax. Most people are able to deduct fully the amount of mortgage interest paid during the year as an itemized deduction any mortgage paid during the tax year. Mortgage Interest is deducted on Lines 10-14 of Schedule A of Form 1040. However, the deduction does have some limitations. The deduction is limited to mortgages you took out after October 13, 1987, to buy, build, or improve your home (called home acquisition debt). You also can only fully deduct mortgages that had balances totaling $1 million or less ($500,000 if married filing separately). If the balances on your mortgages totaled $1,000,000 million or more see the table below to see if you qualify for a partial deduction. Take your documents out of envelopes - neatly organized files saves you time. Unless you want to pay your preparer to sort, organize, and add up receipts. Have your receipts organized and totaled by category. Have other relevant documents organized by category. Provide relevant computer data files - If you track your finances with a program such as Quicken or Excel, bring the data file with you OR provide category reports to the accountant. He may see a deduction you missed or need additional information then. You also may want to provide a year end credit card statement for same reason. Provide closing documents if you bought/sold home. A summary sheet with all information you are providing is always helpful but not necessary. This will make sure we don't miss anything. Okay lets say you want to sell something on Craigslist. How about we say it's refrigerator. This is missing a lot of information and you are not going to get a lot of serious replies. You may also miss serious takers because they are not willing to email every ad asking for more details. Photo ... if you do not have a digital camera find a stock picture of item off the internet... do a Google image search. If you do not want to list all this information and the item is still for sale find the item on Amazon.com or other retailer and link to it. List if the product Manual is included. If you don't have manual you can usually find the manual on manufacturers website. Find the manual and include link to it in your ad. Spend a little time on your advertisement and you will be surprised at the responses you receive. Effective May 12, 2008: the current price of a stamp is 44 cents. First-Class Mail Letter (1 oz.) is 44 cents. Each additional ounce costs 17 cents. Postcard stamps are now 28 cents. Update: On May 11, a first-class stamp will go up by 2 cents to 44 cents. Other rates are set to rise as well. The updated prices are reflected above. The post office adjusts rates each May, but any increases must be at or below the rate of inflation under a 2006 law. Okay now I will stop sounding like your grandpa. I am a CPA and use Microsoft Excel spreadsheet software everyday. Being advanced in Excel makes my job extremely easier. I figured I'd see if there is anyone out there who has quick questions in excel that I can help. Hey what can I say I'm a generous guy. To ask your question, use the comments form below! I will post responses to your questions below. I do not answer replies through email, as posting the answer here will help others who may have the same question as you. Note: Please provide enough information for me to be able answer your question (the more info the better). The more effort you put into your question the more effort I will put into my response. Fueleconomy.gov Compare the miles per gallon and annual fuel cost between models before making your decision which model you buy. Edmunds This has everything from reviews to price quotes. I suggest you get a price quote for the model your interested in and bring this to dealer with you as it could be used in negotiations. Also determine the value of your used car before you trade it in. 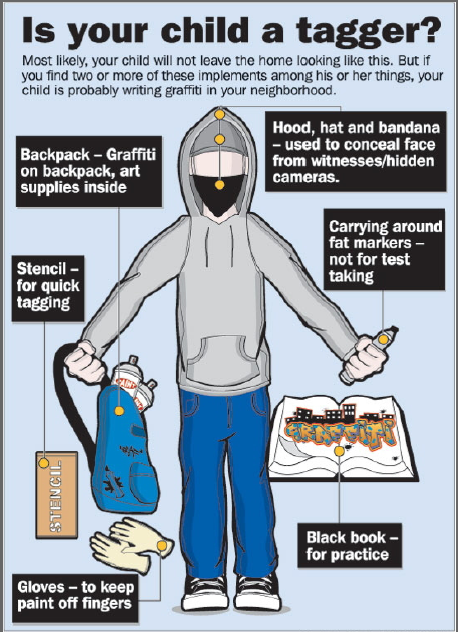 Warning for Parents: Is your son a tagger? Is your son a tagger? I saw this while doing a Google Image Search. It comes from the website of the City of Santa Ana, California. This is not only ridiculous because all of these points are obvious. If my child had any of these things it would lead to ask him "what the heck are you doing with that? Most people will be receiving a credit from the Government as they hope to stimulate the economy and reduce fears of recession. Will it work? Probably not, but that's a whole other story. Here is the lowdown on the credits. When will I get the check? If you are eligible you will most likely see your check in May or July. Your credit is $600 if single and $1,200 combined if married. You also receive an additional $300 per child. Your 2007 adjusted gross income(AGI) has to be less than $75,000 single or $150,000 married. You can find your AGI by look on line 7 of Form 1040. If your adjusted gross exceed 75,000(single) or 150,000 (married) you may still receive a partial refund. Now multiply the result by 5%. This is the amount you reduce your credit by (see "calculating your credit above"). You can't complain at the president if you don't do your part in selecting the right one! To register: Use the link below and select your state and fill in web form. It will generate a customized PDF which contains your registration form. Print it and follow the directions to sign, fold, put on a stamp and mail it in. Include a photocopy of your identification (a drivers license or US passport) with it if you can. You can without sending in a copy of your ID, but you will have to show ID when you vote the first time (bring your ID to the polls regardless, just in case). You should get a conformation mailing back from your state. In Idaho, Minnesota, New Hampshire, Wisconsin and Wyoming you may register to vote at your polling place on election day. Google Images is an awesome tool. Need a picture of a "guy with a fro"? Type that into the the search bar then hit the images tab to get one. Google Video: Search through 1000's of TV programs and web videos or share your own videos with the world. Google News: This is another feature I use almost every day. Search thousands of current and past news stories. Search for your hometown to see your local news. I'm Feeling Lucky: This is for when your search terms are precise, you can hit this button and Google will forward you to the one site that best fits your search terms. Disclaimer: Tjshome.com is not affiliated or endorsed by Google. Google is a trademark of Google Inc. . It always amazes me how much news comes out of New York. It seems like 70% of the news stories I read from CNN or MSNBC seem to be from either NYC or some odd town in upstate NY. Well I decided to some "Goosearch" to help prove my hypothesis. First, lets define "Goosearch" as some of you may not know what it refers to (I just made it up): Goosearch is using the quantity of results for a specific phrase to prove the popularity or every day usage in culture of a term. Which state is the most newsworthy? Looks like New York is the most news worthy state by far. New York had 100% more results than the California which was the nearest contender. However, unlike many other state's New York's largest city, "New York City" also has the state's name in it so could this scewing results? A search for all news articles including "New York" but not "New York City" returns 347,383 results, not significantly different for a search for just "New York"
Is New York City the most popular city in the world? I am going to do a reinstall of my computer and started making a list of all the programs I need to reinstall once I am ready. Not all of these I use as I added some programs I intend to use or other suggestions that may be useful for others but not for me. Thanks to the SAforums and Steve for letting me know about these programs. Gmail notifier - for gmail users, alerts you when you have new Gmail messages. Startup Control Panel - Configure which programs run when your computer starts. ISORecorder - powertoy to burn CD and DVD images; create an ISO from any folder. launchy - enter in the name of an application and it finds it. Weather Watcher - Weather in your system tray - I do not use this program but this may useful for those looking for something like this.. as this one does not contain spyware/adware like most of them do. Dscaler For those who have a TV tuner installed this is the program to watch it with. Here is how your Taxes work out in a very summarized manner. Misconception #1 All tax deductions are a direct deduction of my tax liability - This is not the case. Most tax deductions are 'above the line' deductions which means they reduce the amount of income subject to tax. A tax credit only reduces the amount of tax you pay dollar-to-dollar. Misconception #2 Tax refunds are a good thing - not necessarily. A tax refund is an interest-free loan to the goverment. A tax refund does not reduce the tax you pay during the year it only effects the time you pay it. If you owe money at the end the year, this means, that you did not withhold enough from your paychex during the year, if you get a refund you withheld too much taxes during the year. If you are good with savings, a refund means that you lost out on the interest that refund would of earned had it been in your bank account the whole year. Disclaimer: Any tax advice included in this written or electronic communication was not intended or written to be used, and it cannot be used by the taxpayer, for the purpose of avoiding any penalties that may be imposed on the taxpayer by any governmental taxing authority or agency. Here is my take on the various Late Night Talk Shows. I dedicate this to the late Tom Snyder who died on July 29, 2007 from complication with leukemia. Snyder was one of early pioneers of late night talk shows with "Tomorrow" in the 80's and 90's and was host of the CBS's The Late Late Show in 1990's. I find Letterman extremely funny. Being from NY definitely makes his show even better to watch as he frequently does local stuff involving the city and surrounding area. Dave has a way of making ordinary people into comic geniuses as he has done with stage manager Biff Henderson, Handyman George Clark and Deli owner Rupert Jee, these sketches are what make the late show original and funny. What I do not like about the show is the numerous pointless unfunny skits that are done from time to time like "will it float?" , stump the band, and "Is this Anything", and most of Alan Kaulter's skits. Dave's show is well known for the Stupid Human Tricks and the Top Ten list. This is most watched late show and has surpassed the late show every year since the 90's. I am not sure why as I don't really find Jay funny. He gets old ripping on the band leader Kevin Eubanks. I find that the writers for the show aren't that good as his jokes often get no laughs and Leno is not that great with covering it up. His most popular feature is headlines on Monday and this a rip off of David Letterman's skit "Dumb Ads" that Dave introduced in the 80's. Yes that is right, Leno is actually ripping off Dave, not as you may have thought as Letterman re-introduced this skit under the name "Small Town News" in 2004 to compete with Leno's segment. CBS - The Late Late Show with Craig Ferguson Craig's Gig is "Let's repeat the same sayings every episode that make people laugh" This is how a normal episode of CBS late late show goes. 1. Craig Ferguson enters saying to the audience "Enjoy the show, sit down , lay down...take off your pants." 2. Craig opens email bag tell audience to email him at "Craig@internet........com" 3. Craig Calls voice mail and pertains to dial 10,000 numbers just to get to his voice mail as if this demands laughter every single time. I do not know how people can watch his show every day with out getting annoyed at the amount of the stuff he repeats each day. I get tired of it after watching twice in a week. This show would be funny if it didn't have the repetitive crap. NBC - Late Night with Conan O'Brien When I heard that O'brian was replacing Leno on the Late show in 10 years (less now) I was not that excited. Conan to me was the combination of "Let's act stupid and people will laugh" and "Lets make of fun of myself so people laugh". However Conan has some great monologue's and skits and they never get old. Last Call with Carson Daly, NBC There is nothing much to say about this show. When I watch him he always look as if he doesn't even know why he's there, and with good reason. The show does not have much content and Carson is just so bleh. The only good thing about this show is it pulls in some good music talent. The Daily Show with Jon Stewart, Comedy Central I think Jon Stewart is great and I'm not sure why but I do not watch his show much. I think a lot has to do with the fact his show is on Comedy central and not a major network. His show is more geared toward turning current news into humor and does a great job at it! I feel Stewart would make a great replacement for Letterman.